Aldo Zelnick is a 10-year old boy living in Colorado with his parents and his older brother. He's a bit lazy, unlike his older brother who is quite athletic. While on summer vacation, Aldo's grandmother, who everyone calls Goosy, gives him a sketchbook and encourages him to record all his "artsy-fartsy" ideas in it. Then his neighbor suggests he write in it as well. He reluctantly starts drawing and writing. Soon, Aldo discovers a love of sketching and creating cartoons. But when he leaves his sketchbook in the fort he and his friend Jack built, he suddenly finds girly drawings mixed in with his own. Now they're on a quest to figure out who tampered with his sketchbook ~ and to make sure they don't do it again! 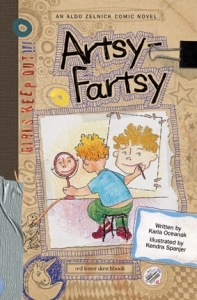 Artsy-Fartsy by Karla Oceanak starts with a similar premise as Diary of a Wimpy Kid ~ a kid is given a journal/sketchbook and reluctantly starts writing and drawing in it. But Arsty-Fartsy is geared toward a slightly younger crowd. The author recommends the Aldo Zelnick series for ages 7-13 and this seems right to me. The characters in the book are in elementary school, rather than middle school, so the issues they're dealing with are a bit more appropriate for elementary aged kids. C has read the first four Diary of a Wimpy Kid books, but they introduced some topics I wasn't crazy about. Artsy-Fartsy is perfect for him at age 7, and I'm exited to know he'll have the rest of the series to look forward to over the next few years. One of the great things about this Aldo Zelnick series is the focus on vocabulary. This first book, Artsy-Fartsy includes more than 50 interesting words that begin with A, such as annihilate, apprehensive and augment. They are marked throughout the book with an * and then there's a glossary in the back of the book that defines each one in a fun and easy-to-understand way. I love this method of introducing new vocabulary words. The next book features B words, and so on. So far there are three books in the series: Artsy-Fartsy, Bogus and Cahoots. I received the set as a prize for participating in the Armchair BEA Twitter party back in May. C is now reading Bogus and seems to be enjoying that one too. Dumbstruck, the fourth book in the series comes out later this year. If you have an elementary aged kid who is interested in the Diary of a Wimpy Kid books (and may not be ready for the topics in that series), or enjoys funny, realistic stories written from the perspective of a kid, definitely have them try this Aldo Zelnick series. I think they'll like it! This review was written based on a copy of Artsy-Fartsy that I received as a prize from the Armchair BEA. I was under no obligation to write a review of this book. What have you been reading with your children this week? Hop on over to Mouse Grows Mouse Learns to share! And check out Book Sharing Monday too! I think there has been an issue withcomments on this post. I apologize. You should be able to comment now. If you can't, let me know. Thanks!